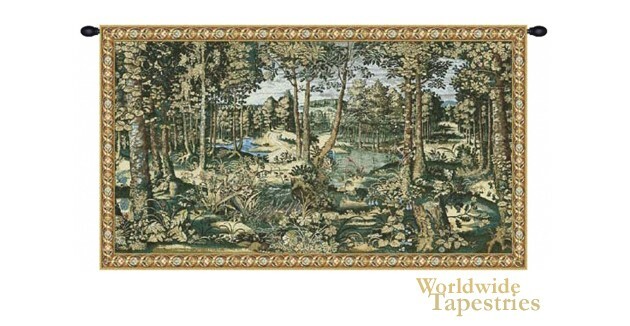 The Royal Forest tapestry shows a forest scene based on the original commissioned by King Sigismund Augustus of Poland from the 16th century. Here we see the forest and all its flora and a flowing river, the original of which was created by Michiel Coxcie of Mechelen, and now is in Wawelburcht Castle in Krakow. This large panoramic tapestry creates a wonderful effect and is a glorious example of the verdure or greenery study that has been used to adorn castles and homes for centuries. The other tapestries in this series are Iris, Woody, Timberland, Underwood, Wooden Hills, Woodland. This Paysage Flamand tapestry is backed with a lining and a tunnel for easy hanging. Note: tapestry rods and tassels, where pictured, are not included in the price. Dimensions: W 76" x H 40"